You can have skin that's soft, clean and fresh and you can do it naturally! 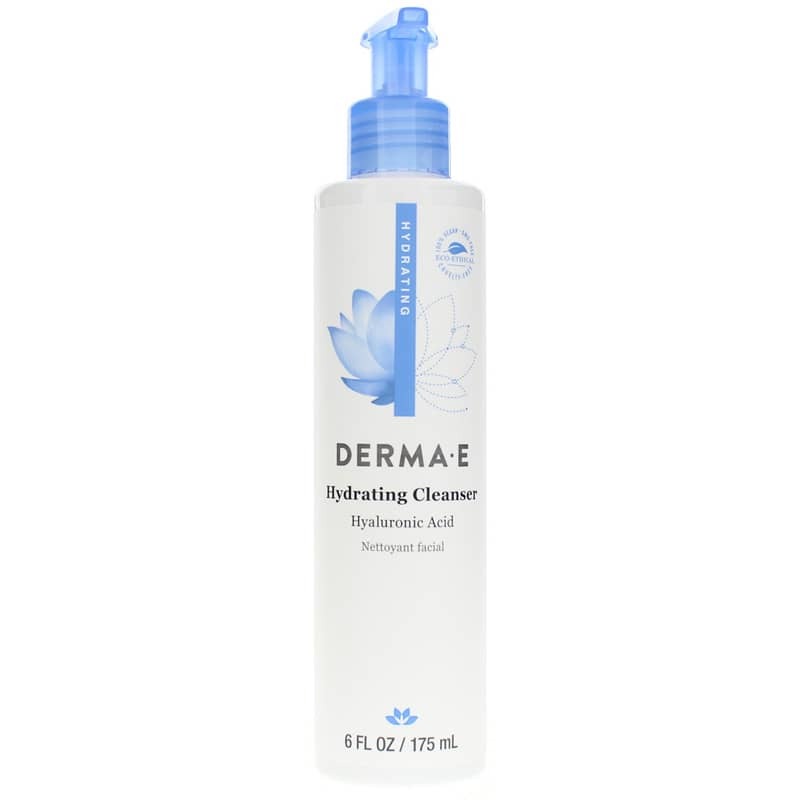 Hydrating Facial Cleanser from Derma E is made with hyaluronic acid to provide you with deep moisturizing effects as you wash away dirt, oil and other impurities. It's also infused with organic chamomile, organic lemon grass and papaya. Plus, it provides Vitamins A and E for healthy skin. But what you won't find in this facial cleanser is just as impressive. Derma E's Hydrating Cleanser is completely free of parabens, sulfates, lanolin, GMOs and gluten. 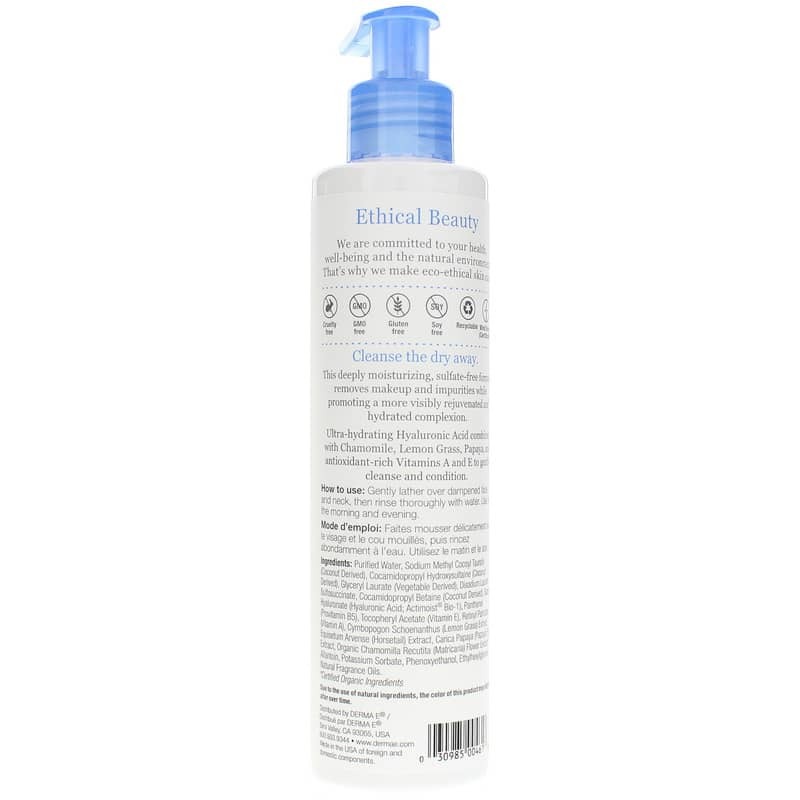 Why use products containing potentially harmful ingredients when you can go all-natural? 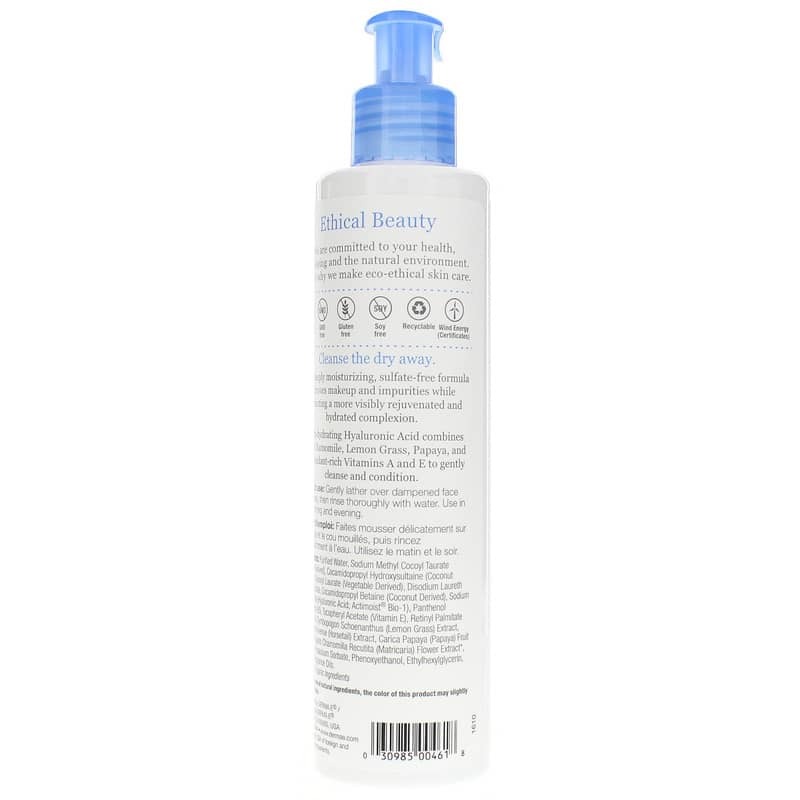 Choose Hydrating Cleanser with Hyaluronic Acid from Derma E today. Purified Water (Aqua), Sodium Methyl Cocoyl Taurate (Coconut Derived), Cocamidopropyl Hydroxysultaine (Coconut Derived), Glyceryl Laurate (Vegetable Derived), Disodium Laureth Sulfosuccinate, Cocamidopropyl Betaine (Coconut Derived), Sodium Hyaluronate (Hyaluronic Acid; Actimoist Bio-1), Panthenol (Provitamin B5), Tocopheryl Acetate (Vitamin E), Retinyl Palmitate (Vitamin A), Cymbopogon Schoenanthus (Lemon Grass) Extract, Equisetum Arvense (Horsetail) Extract, Carica Papaya (Papaya) Fruit Extract, Organic Chamomilla Recutita (Matricaria) Flower Extract*, Allantoin, Potassium Sorbate, Phenoxyethanol, Ethylhexylglycerin, Natural Fragrant Oil Blend. Gently lather over dampened face and neck, then rinse thoroughly with water. Use in morning and evening. I love this product. For one thing it has a nice scent. Usually if it is natural there is no scent, or a bad scent. This doesn't leave my face dry feeling. It cleans really good. I also have the Day Cream and Night Cream. Love them all.